Politics is dirty and only the brave dares and survives in it in Nigeria, using elements of lies and propaganda which is only busted by truth presented by journalists, activists and well meaning citizens. The dirt for 2019 general election in Nigeria may have started in earnest as the Delta State Oil Producing Areas Development Commission (DESOPADEC) has put in machineries in place to apparently tell lies to Deltans and sell propaganda to them, instead of showing the achievement of the State Governor, Mr Ifeanyi Okowa. A group known as Okowa coalition headed by one Godspower Asiwhu who is the Peoples Democratic Party (PDP) Chairman in Patani Local Government Area and doubles as the Governor’s SA on Social Media, is championing the cause of governance by lies. 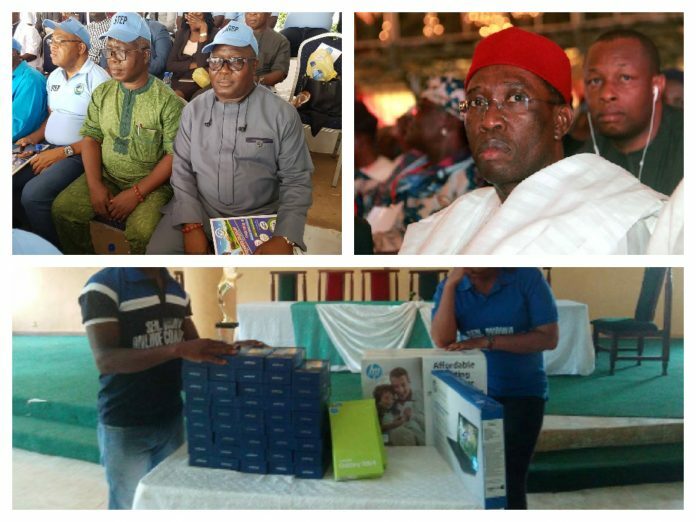 In an event which held on Thursday in Asaba by the group, SecretReporters can authoritatively report that the over fifty android phones, Ipads, laptops and printers shared to their members and participants were bought by DESOPADEC, even though it was made to look like the coalition bought it. According to a reliable source, the money was pulled out of the commission’s purse through the Executive Director, Finance and Admin, Mr Askia Ogieh and the phones bought by his SA, one Prosper Edo, who earns double political salaries as also SA on DESOPADEC to the Governor. We gathered that over N25 million was allegedly signed away by Makinde to the group, but only N12 million was spent to buy the gadgets and organize the event, while the rest were fleeced by Makinde and Askia. During the event, Makinde’s PA on Social Media, Owen Nero and Prosper promised to give ten persons the sum of Ten Thousand Naira monthly as subscription. “Those guys have finished DESOPADEC, if not, how can a church rat like Owen and Prosper be talking about giving money monthly. How much is their salaries”, a source queried. In a chat with SecretReporters, a staff of the board vented anger on why Makinde should be giving out money to sycophants just to praise sing Okowa, when he has not paid them their allowances. “The board is an intervention body not a place where everyone with criminal ideas comes to get support like those boys just did. Tell him to release the voucher for those phones and you will see about N40 million penned down and channeled as social services. What kind of state is this? We are complaining of payment and people are pulling out money to buy phones just to post verbatim on facebook in the name of coalition”, the angry staff wailed. A group has vowed to drag Makinde, Godspower and the rest to the Economic and Financial Crimes Commission (EFCC) to write statement on how they used state finances for a political pressure group.